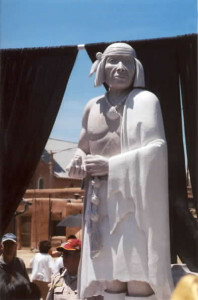 On August 10, 1680, this medicine man from the Tewa pueblo led a meticulously planned and coordinated revolt by Native American pueblos against the Spanish overlords. The rebellion culminated in the invasion of Santa Fe (New Mexico) on August 15. The Spanish did not regain control of Santa Fe until 1692 and of all the pueblos until 1696.